There is an old military adage that says that generals like to fight the last war. It became famous during World War II, when France’s famed Maginot Line, built to prevent German aggression from the east, proved useless, because Germany invaded France through Belgium instead, avoiding the newly-built fortification along the Franco-German border. During the Six Day War in Operation Focus in 1967, Israel launched spectacular simultaneous attacks on Egyptian, Syrian and Jordanian air bases making runways and hundreds of aircraft of the three countries inoperable. On December 3, Pakistan decided to do the same and launch a pre-emptive strike on India. But the Pakistani commanders apparently forgot that many Indian commanders had gone to the same British military academies, and some had also served together in the British army. They too had followed battles elsewhere and knew what lessons to draw. The Pakistani raids failed badly because India had anticipated Pakistan’s plans and had already moved its aircraft elsewhere, keeping them protected in bunkers. In fact, on the same night the Indian air force was able to retaliate with massive air strikes. What Pakistani planes wanted most was to inflict damage on parked aircraft, but there were no sitting ducks for them to shoot. India’s aerial combat strength was not affected. Pakistan had targeted twelve Indian airfields and dropped 183 bombs and reported 120 hits, but damage to Indian aircraft was minimal. Pakistan had managed to surprise India, but the raids failed to disable Indian air power. Squadrons of Indian Canberras flew against airfields in Murid, Mianwali, Sargodha, Chander, Risalewala, Rafiqui, and Masroor, and caused severe damage in Sargodha and Masroor. The IAF also hit the east—Tejgaon and Kurmitola airports in Dacca. Within two days, India had complete air superiority in East Pakistan. Rokeya Kabir heard Indira Gandhi on the radio that night. ‘We now knew that the end would come soon. We saw Indian fighter planes in the sky. We saw the Indian army going into Bangladesh—we were filled with joy,’ she said. The land battles began in the west before spreading to the east. Indian land forces were ably commanded by Lt. Gen. Jagjit Singh Aurora, who headed India’s Eastern Command. Maj. Gen. K.P. Candeth who had helped India take over Goa in 1961 commanded the Western Command. And Lt. Gen.
J.F.R. Jacob of the Eastern Command made detailed plans to take over Dacca. On 4 December, Pakistani troops attempted to reach Jaisalmer but India pushed them back at the desert border post of Longewala in Rajasthan. When the mechanised Pakistani infantry moved in, the Indian infantry was able to hold out because it was confident of receiving air cover. Pakistan’s failure to destabilise the IAF was now hurting its advance. It had not anticipated that the IAF would be combat-ready, because it had thought that Operation Changez Khan would have demolished many Indian aircraft. But the Indian ability to bomb from the air made Pakistani ground troops vulnerable. Obstacles India had placed along the border confused Pakistani troops in darkness. The following day, India took over Pakistani territory in Basantar in the Punjab-Jammu sector. Once the battle shifted east, Pakistani vulnerability was exposed. India’s Eastern Command was backing three Mukti Bahini brigades and thousands of irregular troops (such as the Kaderia Bahini), against Pakistan’s three divisions. Planes took off from the Indian aircraft carrier Vikrant and struck Chittagong, Barisal and Cox’s Bazar, making Pakistan’s navy in the east inoperative and blockading the ports, cutting off escape routes for Pakistani troops. Indian ground attack quickly overran the country. Pakistan could not mount an effective defence, because its soldiers were scattered along the border to deal with small incursions from the Mukti Bahini. East Pakistani towns along the border fell quickly to the Indian forces. An Oxford scholar, Frank Jackson, wrote a paper on the war soon after it ended, in which he explained that Indian border advances were successful because ‘Pakistani forces had largely withdrawn from scattered border-protection duties into cleverly fortified defensive positions at the major centres inside the frontiers, where they held all the major “place names” against Mukti Bahini attacks, and blocked the routes of entry from India’. But the defensive move was not effective in keeping Indians at bay. Kaderia Bahini was supporting the Indian army. Kader Siddiqui, better known as Tiger Siddiqui, said he had sent field-eye sketches of possible targets to bomb in Dacca, and the IAF bombed those spots on the first few days. When the Indian forces found it difficult to cross the Brahmaputra in Jamalpur, Siddiqui’s fighters attacked Pakistani defenders so that Indian troops could advance. Siddiqui’s moment of vindication was on 11 December, when Tangail fell. India’s numerical strength was overwhelming. 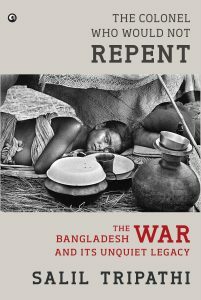 It had two army corps from West Bengal, one from Meghalaya, and one detached formation that included paratroopers who would land in Tangail. The air force provided air cover. Pakistan had more than four divisions. But Pakistan was unable to add new troops from West Pakistan because Indira Gandhi had forced Ceylon not to offer its airport to refuel Pakistani military aircraft anymore. If Indian armed forces were successful, it was not only because of their preparedness, but also because of the masterly diplomacy Indira Gandhi showed in the months leading up to the war. She travelled around the world, charming some governments, annoying others, and gradually changed public perception and diplomatic opinion while effectively cutting off all supplies to East Pakistan. She agreed to wait for the torrential monsoon to subside, and then forced Pakistan to make the error which justified the massive Indian retaliation. On 6 December, she declared in the Lok Sabha that India recognised Bangladesh. Bhutan followed in a few hours, and later that week, Poland joined. The radio station Shadheen Bangla Betar Kendra changed its name to Bangla Betar (Bangladesh Radio), dropping the assertive ‘Shadheen’, independent, because it now believed it was independent. Once you are independent, you don’t need to proclaim it. On 7 December, Mukti Bahini troops took command of Jessore, Sylhet, and Moulobi Bazar. India’s success also owed much to the brilliant planning of Lt. Gen. Jacob. Manekshaw’s early thinking was to invade East Pakistan by capturing the border provinces of Khulna and Chittagong. But that would leave the prize— Dacca—beyond reach, because other Indian officials thought the UN would intervene and demand a ceasefire. Marching through Bangladeshi wetland wasn’t an easy prospect either. Jacob however felt advances were possible by ensuring that the army would keep moving throughout the country. A successful campaign had to end with the surrender of Dacca. As the Pakistani army was staying close to towns and defending them, the smart strategy lay in bypassing the towns and following trails that the Mukti Bahini would identify, and thus neutralise Pakistani strength in towns by using alternative routes to reach Dacca. The strategy would eventually succeed. India sidestepped facing Pakistani troops, their communication was disabled and they were left encircled. Jacob thought Dacca would fall within three weeks; in the end it would crumble in two weeks.